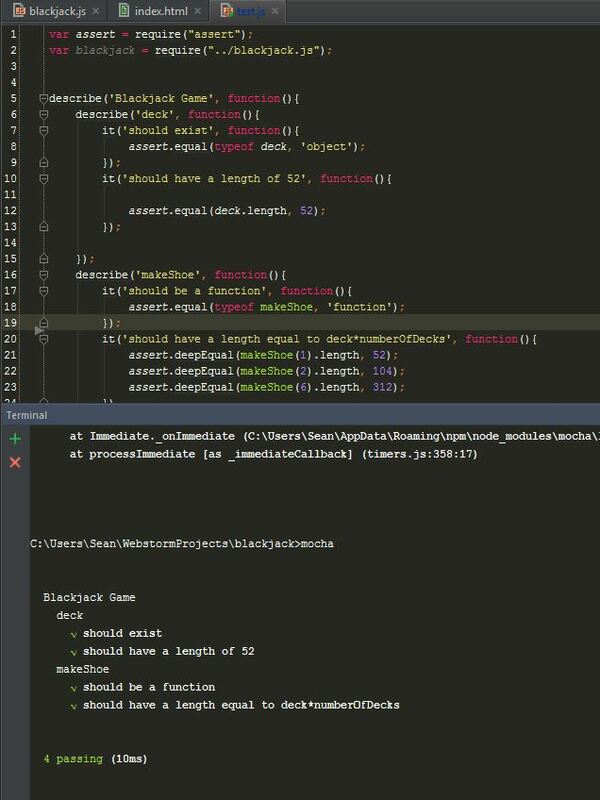 I decided to document the process of TDD with a short screencast that includes the first few steps of the TDD process. In the video, I write a failing test, write code that doesn’t pass, and then write “bad” code that makes the test pass. I’m hoping to demonstrate the principle, as I understand it, of writing the simplest code that makes a test pass. The last step in the video is writing an additional test that exposes the weakness of my simple code and will put me on the path to writing functional code. It’s just a few minutes long, but I suggest you watch in in HD (at least 720) and full screen, if you want to be able to read the code. My understanding of Test-Driven Development is this: Start from scratch, write a failing test, run the test, write the simplest code that will make the test pass, write another test, etc. There is some nuance there that is hard to put into words but easier to put into practice. Usually your second failing test will require rewriting your simplest code from the first failing test into actual working code. Also, you want to keep writing tests about the same general thing until you are satisfied that thing is finished (or as finished as you need it for now). There will be some examples shortly. For now I am not including betting. Point 6 breaks down into another list of choices like split and doubling down. But that’s the broad outline, and the order in which I think I am going to tackle the programming. So the first step is to have a deck. At this point I have no code at all, which means it is the perfect time to write my first test! Just the failing test I was looking for. I haven’t created deck, or anything else yet. Let’s fix that. Re-run the test, it passes! That was simple, but that deck is empty, we wouldn’t play with an empty deck, would we? We need a deck that has 52 cards, let’s test that. And of course, that test fails. Remember, failing is a good thing! So I filled the deck array up with 52 members. On some level it is probably important to know what those members are and to test against that as well, but I took the liberty of moving on. I can always come back once that is important. I lumped a set of three “subtests” into one test that checks that the decks add up to the right number of cards. I don’t know if that is the right way to do it, but it works well enough. 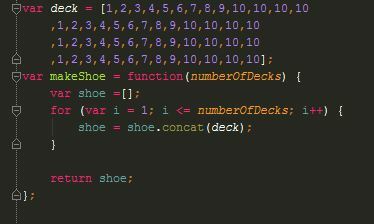 Below is the totality of the blackjack code I have written so far. Not very impressive, but it all does exactly what I want it to do, for now. Next up is shuffling the shoe. I have to figure out how I am going to test that and then how I am going to actually shuffle. I copied a shuffling algorithm from a stack overflow post a few days ago that I know works, but I didn’t really understand how. I need to sit down with that for a while and see if I can make sense of it. I think the test I will have to compare, somehow, the starting shoe array against the shuffled shoe array. The details elude me, but I am working on it! One of the upsides to using the GitHub Pages is that it provides an easy way to share my work as more than just lines of code. One needn’t guess at what my functions will do or copy the code somewhere else and run it. One can just go to the page and run it, probably exactly how I see it (unless you use an ancient browser and, why would anyone do that?). A side-effect of using GitHub Pages is that it makes it really easy to submit my work to the One Game A Month game jam/challenge/thingy. My friend Chris turned me on to #1GAM some time in December and I figured I could use all the help I could get staying motivated. Having goals that are tracked (to some extent) externally helps me push through the hard days. The days where it is easier to make an excuse than look at my code. At one point, I was pretty sure I was going to have a finished and polished version of the backgammon game to submit well before the end of January. Time did what time does and mid-January turned into “some time before the end of the month.” Once January turned into February, my motivation to fix the game evaporated. I was discouraged. I had missed my deadline, I couldn’t really see a quick way to fix the few glaring bugs and I still had no idea how I was going to painlessly host the game so that I could submit it. I was stuck in a negative reinforcement loop. Voltaire’s lifted quote eventually got me out of my funk. “Perfect is the enemy of good.” I needed to embrace the fact that I am doing the best (or nearly) as I can and move forward. Setting my game up on GitHub Pages allowed me to get over that hump and be comfortable with the progress I have made so far. I will continue to tinker with backgammon, but I know I have to get another project going. Starting from scratch, again, will allow me to use the skills I have learned without being dragged down by the baggage of my (admittedly small) code base. A brief explanation of the controls: Reset Board starts the game by setting up the checkers and rolling the initial dice (one dark, one light, high die goes first). To move a checker, click on either die and the checker you want to move, in any order. There are some rudimentary alerts set up if you click the wrong things. The counters in the middle are the “jail” cells. The counters on the right are the “endgame” counters. First to 15 wins. To play from jail, pick a die and then click on one of your own checkers (it’s not intuitive and I would like to change that eventually). I’m probably missing some details, ask me anything! Tell me if you run into any bugs (I know of at least one already). Thanks for giving it a look! I like learning languages. I am not very diligent about it, so my progress is unimpressive, but I keep plugging away. Computer languages have some fundamental differences from spoken languages, but they also share some key concepts. In some ways, the paradigm of learning the two types of language is reversed. In computer languages, I feel like I am learning from general to specific. From informal (psuedocode and big-picture concepts) to the formal (syntax and curly braces and proper everything everywhere). Spoken language learning has always felt like I learn the formal, classroom versions of the language and then in real life I have to sand down the corners and pay less attention to the rules. To that end, I am going to start looking at more complex projects and really try and pick up on the concepts. I need to get out of my comfort zone, or I’ll never get any better. There is definitely a lot of stuff to learn in this field, as I am made painfully aware of every time I look at software job postings. I need to find the tools that should be on my belt and become well-versed with those tools. It can only get easier… right?